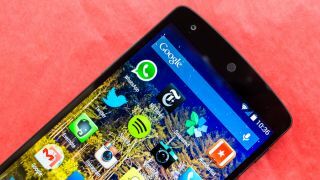 Ever since the Google Nexus 5's availability began wavering late last year, we've been expecting to see it dropped entirely, and now that day has finally come. Just like Google promised, the former flagship remained on sale for most of 2015's first quarter, but now it's MIA in Google's Play store and Google's brand new non-Play store. "The Nexus 5 is no longer available for purchase," the phone's page now reads. And it's not the only Google product that's disappeared; the first Chromebook Pixel, a high-end Chrome OS laptop, is also gone, as Ubergizmo points out. It seems Google was in the mood for some spring cleaning this week, which could have something to do with the introduction today of a new Chromebook Pixel with a USB Type-C connector. And there's always the Nexus 6, a bigger and better Google flagship that will surely remain on top - until the next thing comes along, at least. Or how about Samsung's Galaxy S6?